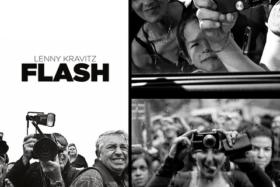 A new photo exhibit, Flash, opened at the Leica Gallery in Los Angeles on March 5. There are three things that make Flash interesting. Number one, the photographer is musician Lenny Kravitz, and number two; the opening coincides with a book of the same name; and number three, the release of a special digital Leica M kit. The exhibition, which will be open until April 6 and might move to other cities, features Kravitz' photographs that shows his career as a musician, as well as the "unusual insights into the nomadic life of a musician." All of the photos were taken by Kravitz with a Leica M.
Leica worked with Lenny Kravitz to create the "Leica M-P 'Correspondent' by Lenny Kravitz for Kravitz Design" kit, which contains a Leica M-P (Type 240), a f/2.0 Summicron ASPH and f/1.4 Summilux ASPH and a black case. The camera case, neck strap and camera are covered in black snakeskin leather. Only 125 kits will be produced, and what makes it special is that each camera and its lenses were "aged" to resemble a Leica camera (Leicaflex) that Kravitz received at age 21 from his father. An elaborate wearing process completely by hand has carefully rubbed, scuffed and scratched the black enamel finish away in several places on both the camera and lenses to let the bright brass surface shine through. The look changes every time the camera and lenses are touched and begins new, personally written chapters in the story of their design. The price of the kit couldn't be determined from Leica's website, although Petapixel is claiming a price of about US$35,000. Someone put up on eBay a Leica M6 with a piece of sandpaper for $36K. The M6 looks spotless, so I'm thinking the owner really doesn't want to part with it.